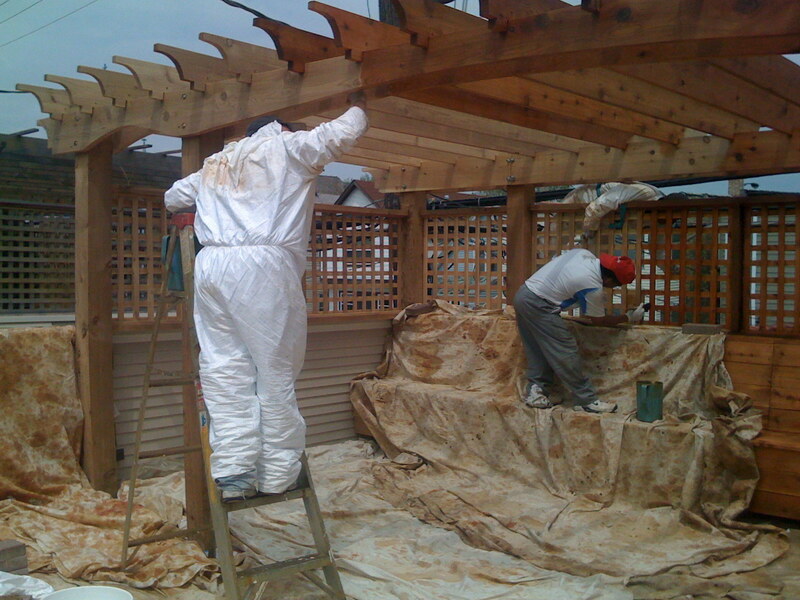 Only the exposed surfaces of the wood are sealed, unless otherwise agreed upon, and must be COMPLETELY DRY, usually 24-48 hours after powerwashing or last rainfall. ALL SEALANT IS APPLIED WITH BRUSHES AND ROLLERS! NEVER SPRAYERS! While spraying is the easiest way to apply sealant, Chicago winds make it virtually impossible to spray sealant without getting overspray onto windows and walls. These airborne particles reach areas even blocks away and can destroy the finish on nearby parked cars, coat children’s toys and expensive grills in nearby yards or ruin the paint on siding and garages, costing thousands of dollars. The time saved by using a sprayer is not worth the risk of costly repairs or lawsuits from disgruntled neighbors. Our crews take all possible care to protect the property and its surrounding area. All areas to be protected are tarped extensively and all plants are lightly watered with a garden hose before they are tarped.